The authors write, "More attention must be paid to how honey bees are exposed to pesticides outside of the field in which they are placed. We detected 35 different pesticides in the sampled pollen, and found high fungicide loads. The insecticides esfenvalerate and phosmet were at a concentration higher than their median lethal dose in at least one pollen sample. While fungicides are typically seen as fairly safe for honey bees, we found an increased probability of Nosema infection in bees that consumed pollen with a higher fungicide load. 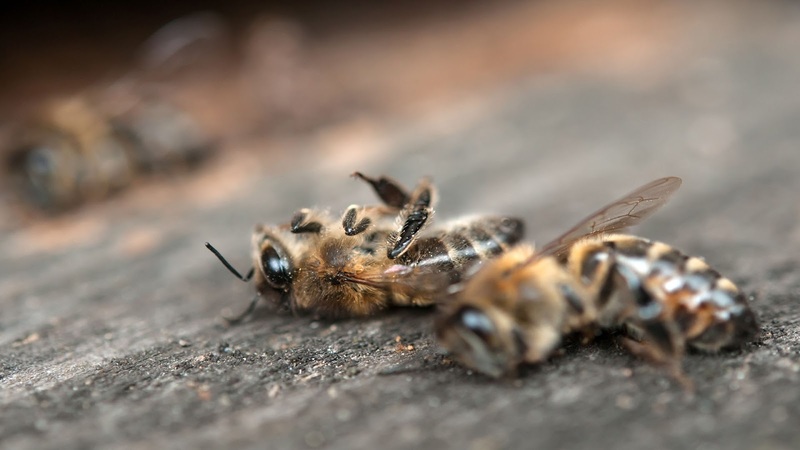 Our results highlight a need for research on sub-lethal effects of fungicides and other chemicals that bees placed in an agricultural setting are exposed to." While the overarching issue is simple -- chemicals used on crops kill bees -- the details of the problem are increasingly more complex, including what can be sprayed, where, how, and when to minimize the negative effects on bees and other pollinators while still assisting in crop production. Right now, scientists are still working on discovering the degree to which bees are affected and by what. It will still likely be a long time before solutions are uncovered and put into place. When economics come into play, an outright halt in spraying anything at all anywhere is simply impossible. Quartz notes, "Bee populations are so low in the US that it now takes 60% of the country’s surviving colonies just to pollinate one California crop, almonds. And that’s not just a west coast problem—California supplies 80% of the world’s almonds, a market worth $4 billion."